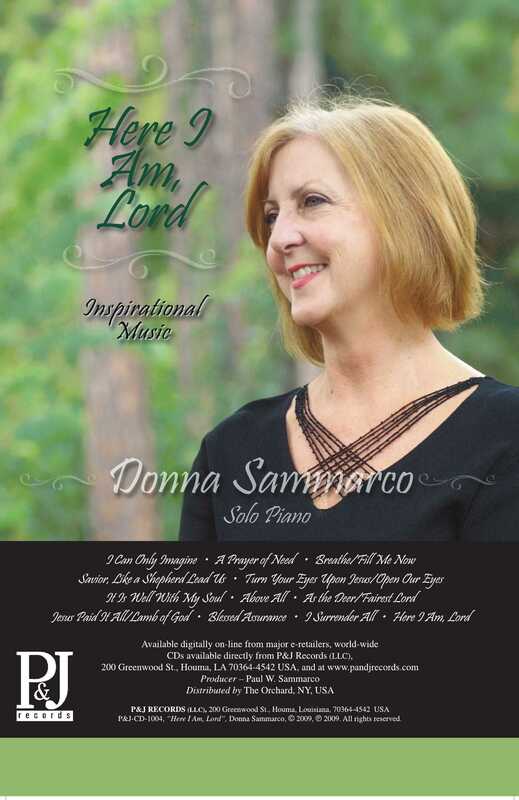 Donna Sammarco’s Second CD Here I Am, Lord – Available now! This CD represents five years of planning and the victory of numerous challenges along the way. There was a clamor for Donna to release a second CD after the success of her first On Eagles Wings. That CD received recognition in the US, Canada, Australia, and other countries in Europe and Asia. Its popularity grew steadily, and the CD, particularly its title track, has been become popular in at least 9 countries and continues to be so to date. Plans were made for a second CD, but one obstacle after another stood in the way. Donna developed some physical problems that made it difficult for her to play. After many prayers, treatments, surgery, and a slow recuperation, however, the Lord finally agreed that it was time to get to work on this project. Thus, this CD represents a victory and a triumph in its own right. Here I Am, Lord combines the old and the new, the bright and the introspective, quiet prayers and shouts of praise. These pieces are offered to the listener as prayers from Donna's hands. They are meditative. They will draw you in and not let you go. They will inspire. At times, they may draw tears. These effects are born from that delicate balance between simple melodic statement, its embellishment with swirls of color from the arranger, and the gentle lifting of that multi-colored canvas to your ears by the performer in a sensitive and delicate manner. This is what Donna does best. It is the juxtaposition of simplicity and complexity in her music that makes it especially mesmerizing. There is a broad spectrum of music presented on the CD. For example, Donna presents Bill Wolaver's arrangement of Bill Millard's I Can Only Imagine in a powerful and heart-warming manner, weaving in and out of musical statements of the anticipation of meeting Jesus. 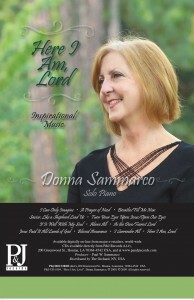 She also provides a memorable and touching delivery of the title song Here I Am, Lord by Dan Schutte a Christian favorite, framed in a beautiful arrangement by Mark Hayes, who breathes his own life into the song. There are also new interpretations of standard hymns, such as Savior, Like a Shepherd Lead Us, Turn Your Eyes Upon Jesus, It is Well with My Soul, Fairest Lord Jesus, Blessed Assurance, and I Surrender All. Some of the tunes have also been arranged Carol Tornquist and Susan Naylor Callaway two wonderfully talented arrangers. There is one tune that merits special mention; it is A Prayer of Need, by Penny Rodriguez. This song is contemporary but was inspired by a poem written by Thomas Kempisin during the early 1400s. The poem and its message live on, even into this millennium. Have you ever heard an instrumental song that relayed a message, despite the fact that there were no words? This tune accomplishes that; you will feel the meaning of the words despite their absence. Copyright 2018 © P & J Records. All rights reserved.